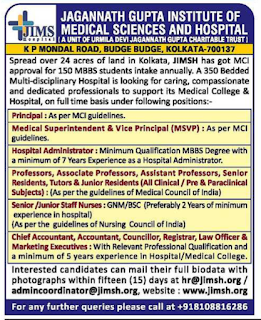 Jagannath Gupta Institute of Medical Sciences and Hospital, Kolkata, has advertised in THE HINDU newspaper for recruitment of Principal/Vice Principal /Professor/Associate/Assistant Professor jobs vacancies. Interested and eligible job aspirants are requested to apply with in 15 days. Check out further more details below. 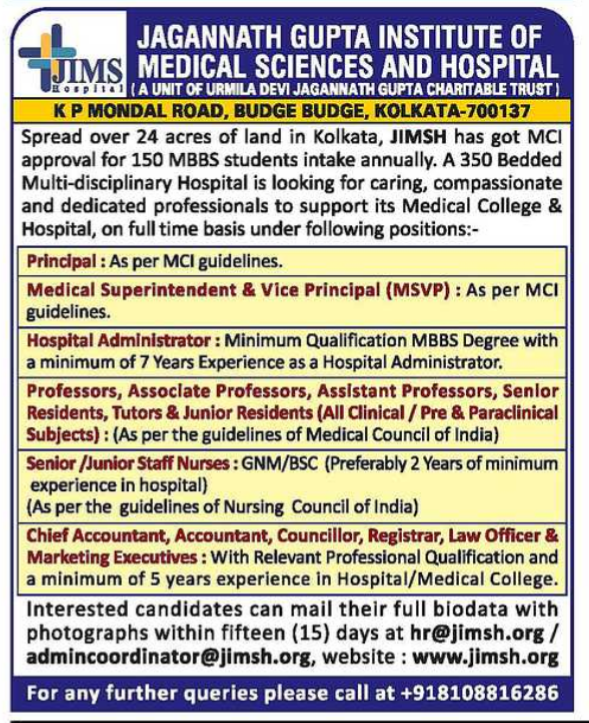 About College:The JIMS Hospital has started operating from JUNE 2016 and already have a full-fledged hospital running with all the state of the art facilities and renowned function and have been appointed to treat the patients with all relevant equipment’s and other required wards with accommodation of a 380 bedded fully functional hospital with 10 bedded emergency, ICU, ICCU, NICU/PICU, SICU. 4 major OTs, 3 minor OTs, 2 labour rooms. All departmental OPDs including General Medicine, Obstetrics and Gynaecology, General Surgery, Orthopedics, ENT, Ophthalmology, Dermatology, Psychiatry, Paediatrics, Pulmonary Medicine, Anaesthesia, Dental, Speech & Audiplogy and Physiotherapy are fully functional with best doctors available all round the clock. All OPDs consultantions are absolutely free of cost for the benefit of socio- economically challenged people in and around south 24 paraganas. Full service diagnostic lab including Biochemistry, Haematology, Pathology, Serology, Microbiology and full service radiology including CT Scan, X-RAY (fixed and mobile) USGS, DEXA scan. In and out patient 24 hours pharmacy and also cardiological tests including ECG, TMT, HOLTER and echocardiogram and a Blood Bank with component separation facility. As per guidelines of Medical Council of India.